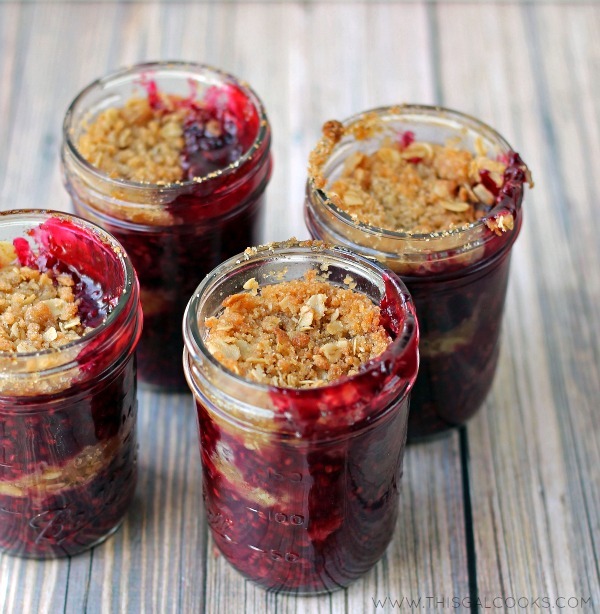 This Blackberry Crisp in a Jar is such a fun recipe that everyone will love. Who can resist fruit crisp?! So do you know my friend Julie from White Lights on Wednesday? Yes! Another Julie. Julie’s are cool people. Just ask Julie. She’ll tell you the same thing! Anyways, my friend Julie and her pal Jen from Four Marrs and One Venus put together this rad recipe competition called Get Your Chef On, or GYCO. 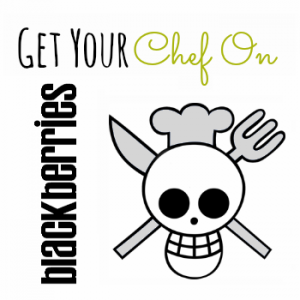 This month’s ingredient: Blackberries. 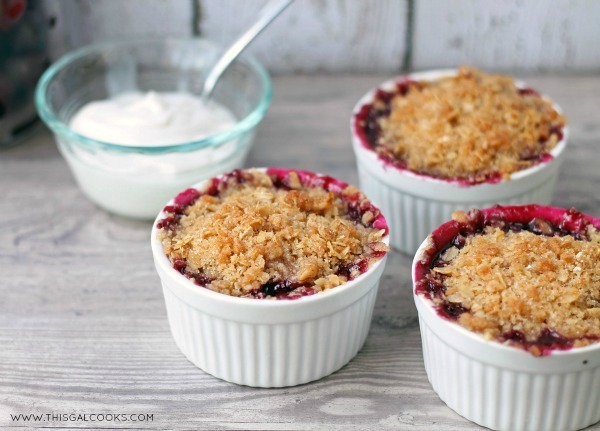 In my quest to develop a tasty blackberry recipe, I eventually settled on blackberry crisp. But not any ordinary blackberry crisp. 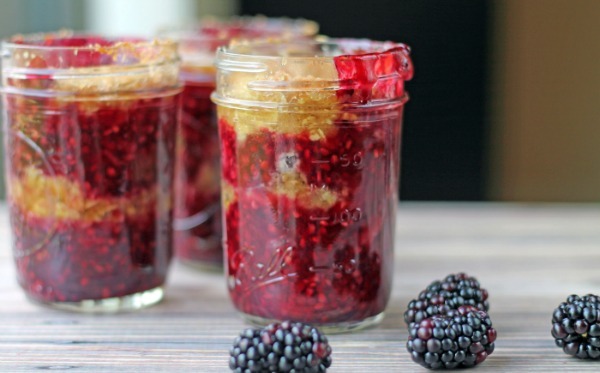 Blackberry Crisp in a Jar. In a jar. Isn’t that a nifty little concept? I’ve seen a lot of cute parfait and trifle recipes in jars. Making a recipe in a jar had been on my to do list. I can finally scratch it off of the to do list. Well, not totally scratch it off. I will be making more jar recipes. It’s so fun to do and they are so cute! Do you want to know a secret? This berry crisp is 100% dairy free. The crisp is made with Earth Balance vegan baking sticks. Trust me, you cannot tell a difference in taste. The vegan baking sticks actually taste pretty good. I’m not affiliated with Earth Balance in any way. I just really like their product! And the crisp topping stayed nice and crispy, even after being covered overnight. Just make sure to allow the crisps to cool completely before covering. Oh wait, do you want to know another secret? There is a layer of crisp in the middle of these jars. YES! You get twice the crisp goodness with these little treats. The only thing negative about these little gems is the abundance of blackberry seeds. You can probably see the little seeds in the jars. I am not a fan of seeds in my food. But some good news about the seeds: they are high in Omega fatty acids! And Omegas are good for you! I hope you enjoy this recipe! Combine the blackberries, ½ C granulated sugar and cornstarch in large pot over medium heat. Mash the blackberries as they are cooking. Cook until the mixture has thickened and is bubbly. Remove from heat and set aside. Combine the all purpose flour, brown sugar, ¼ C granulated sugar, oats, cinnamon and salt. Cut in the vegan butter until the mixture resembles crumbs. Fill 4 half pint mason jars ⅓ full with the blackberry mixture. Add a layer of the crumb mixture. Then add more berries up to the beginning of the rim of the jar. Add the remaining topping to each jar. Place the jars on a baking sheet. Bake at 350 for 20-25 minutes or until the blackberry mixture is bubbly and the crumb topping is golden. Have you followed me via Pinterest yet? Love the pics Julie. Who would have thought…crisps in a jar! And why not. :) Thanks for cooking along with us! You’re welcome, Julie! Thank you SO MUCH for hosting another great challenge! 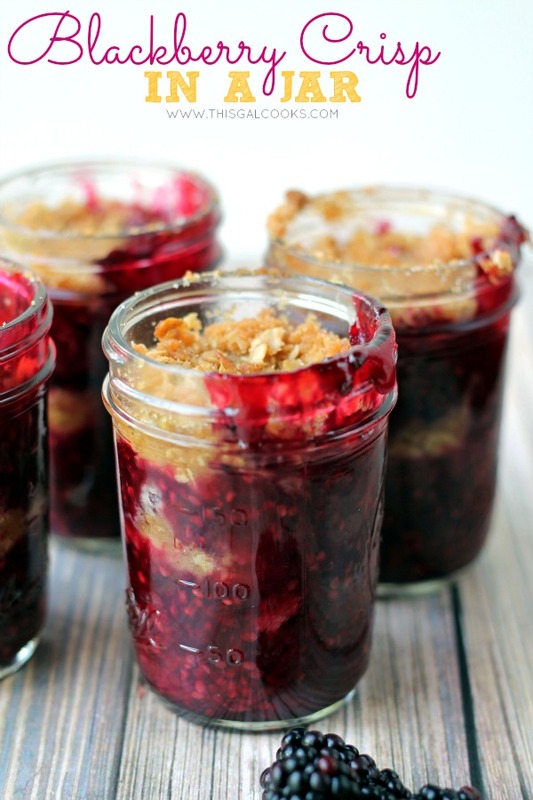 My only concern is for mason jars for the blackberry crisp to be placed in the oven for 20-25 minutes on 350 degrees. Won’t the heat break the mason jars? I understand your concern but I did not have this issue when baking in the jars. I’ve come across other recipes that are baked in mason jars that didn’t have any issues, either. Hope this helps! Thank you for your reply. I’m kind of shocked you responded since you are so popular. yum. This crisp looks like pure perfection. And cooked in jars? Genius! Wow!! I love this idea of crisps in a jar!!!!!!! Thank you, Ashley! I think I am going to get some of the 4oz jars so I can make some other cool goodies! Thanks for stopping by! I love blackberries and crisps… just pass me a jar I already have the vanilla ice cream. :) Yum! Here ya go! ;) I love crisps too. They are so darn good! Hang on I will be right over to help you eat those up! My oh My they look good! Love the idea of crisp in a jar. These would be perfect for a picnic!! They sure would, Zainab! Thank you so much for stopping by! They look delicious!! I have my jars already and have lots of little foodie plans for them – I can never resist a sweet little dessert in a jar. Pinning and sharing!! Thank you, Claire! Now I want to buy some little 4oz jars so I can make some more little itty bitty treats! Thanks for pinning and sharing! These are super cute Julie! I do love desserts in a jar, it makes me happy. :) I think anything in an individual size makes it special. Love blackberry and the topping. Delicious! Thank you, Anne! Desserts in jars are so much fun! These look delicious and I love your photos, so beautiful!! Julie, I love that you did a crisp in a jar – and it looks just wonderful! Yum! Pinning and buffering – thanks for sharing! Well, it lunch time and now I want to eat this! Looks wonderful – i really must try some jar desserts some time… Pinned and sharing! Anything in a jar has my attention. I love this kind of presentation…looks really pretty! Mmmm baked delights with berries just remind me of summer nights sitting out on the porch..perfect recipe for this time of year. Found you through Two Cup Tuesday. Thank you so much, Tammy! These are perfect for summer nights on the porch. They are so easy to grab and take along! My word. Stop in the name of Blackberry ooober gooober oh so yummy!!! Girl! I am loving this! Okay, so last time it was the cute ramekins and now it’s the jars….you’re on a roll. :-) I need to get some of that Earth Balance just to try it. Visiting from Lady Behind The Curtain. Wow, this looks amazing. 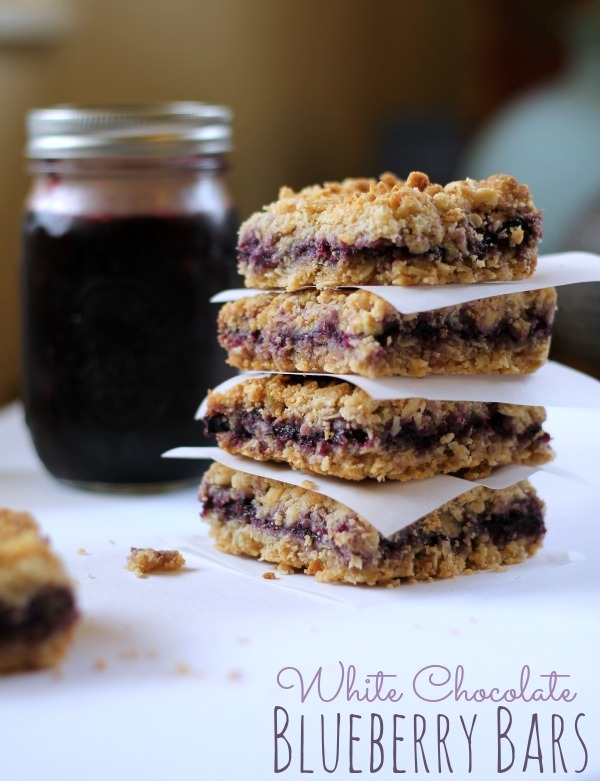 I love anything with blackberries and this crisp looks like the perfect treat! Oh my, Julie! I LOVE this! I haven’t had berries since I came to Japan… they are like gold (so expensive) and I am going to make this as soon as I get back to the States! Visiting from Sugar and Slice Sunday. Love this recipe. Blackberries make any desert special. LOL…I am not a fan of seeds either :) They look delicious,and so cute in the jars. Thanks so much for sharing at Best of the Weekend. Have a wonderful week! Thank you for being such an awesome host, Lisa! Can I substitute the vegan for real butter? Would it still be 6 tablespoons? Also what about raspberries? Looks amazing and I can’t wait to surprise my guest with this dessert! Dear Julie, These look wonderful…they remind of summer with all those beautiful berries. I would never have thought to bake in a jar – who knew they were oven proof! Thank you for sharing. xo, Catherine Pinned for later. Yep, jars work perfect in the oven! And you can use your favorite fruit, too. Thanks for stopping by, Catherine. Hope you had a great weekend! what is the texture of the crisp in the middle? I can see a mixed berry crisp in the near future! I love the idea of the jar desserts. I’m looking at the blackbery crisp now and wondering if I could can it after baking? After taking a closer look at the photograph, I see the are small mouth half pint jars! The ingredients for crisp topping are missing. The ingredients are there, they are just in the wrong spot. I will update the recipe.